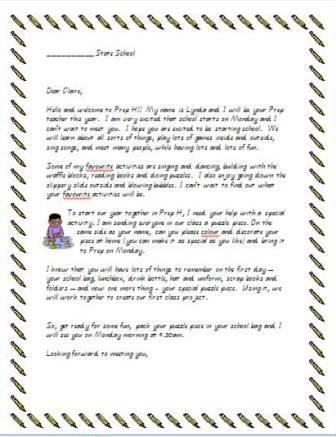 At the start of every school year I like to send the children a letter welcoming them to their prep class and share a little bit about myslf and the things they can do when they come to school. I also include a cardboard puzzle piece that theycan decorate at home and bring to school on their first day. The first thing we do on day one is put our class puzzle together. 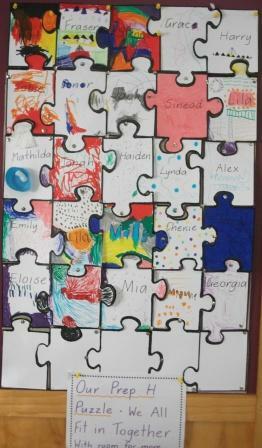 All the adults who work in the classroom make a puzzle piece too to include in this project. There are usually spare pieces and we talk about how there is always room for more in our class and anyone else who joins our class during the year gets to decorate one of these spare pieces. The text for the letter is typed below. Hello and welcome to Prep H!! My name is Lynda and I will be your Prep teacher this year. I am very excited that school starts on Monday and I can’t wait to meet you. I hope you are excited to be starting school. We will learn about all sorts of things, play lots of games inside and outside, sing songs, and meet many people, while having lots and lots of fun. Some of my favourite activities are singing and dancing, building with the waffle blocks, reading books and doing puzzles. I also enjoy going down the slippery slide and blowing bubbles. I can’t wait to find out what your favourite activities will be. To start our year together in Prep H, I need your help with a special activity. I am sending everyone in our class a puzzle piece. On the same side as your name, can you please colour and decorate your piece at home (you can make it as special as you like) and bring it to Prep on Monday. I know that you will have lots of things to remember on the first day – your school bag, lunchbox, drink bottle, hat and uniform, scrap books and folders – and now one more thing – your special puzzle piece. Using it, we will work together to create our first class project. So, get ready for some fun, pack your puzzle piece in your school bag and I will see you on Monday morning at 9.30am. The children love looking at their class puzzle and even now talk about everyone’s piece. On our last day together, at the end of the year, we take our puzzle apart and each child’s puzzle piece is returned to them to symbolise their moving on to another class. I’m going to be teaching Reception next year and I LOVE this idea! I shall be using it. Thank you!